We are delighted to welcome independent journalist David Sheen to Cork, on Wednesday 11th October, to Old Ground Hotel, O’Connell Street, Ennis at 7.30pm. With far-right governments in power in both Washington and Jerusalem, an examination of Israel’s state-sponsored race wars against indigenous Palestinians and African refugees is in order. An unflinching look at the last eight years under Netanyahu serves as a primer on his racist playbook, one which reactionaries on both sides of the Atlantic seem keen on copy-pasting. Can people of conscience help roll back the rise of the racist right, around the world and in Israel and Palestine? Independent journalist David Sheen has been reporting from inside Israel since 2010, with a special focus on racial conflicts and religious extremism. 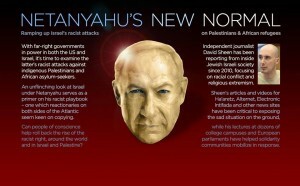 Sheen’s written reports and viral videos for Ha’aretz, Electronic Intifada, and Alternet, among others, have been critical to exposing the dismal situation on the ground, while his slideshow lectures at dozens of college campuses and European parliaments have helped communities mobilize in response. Organised by the Clare IPSC.